Factors behind category management development. 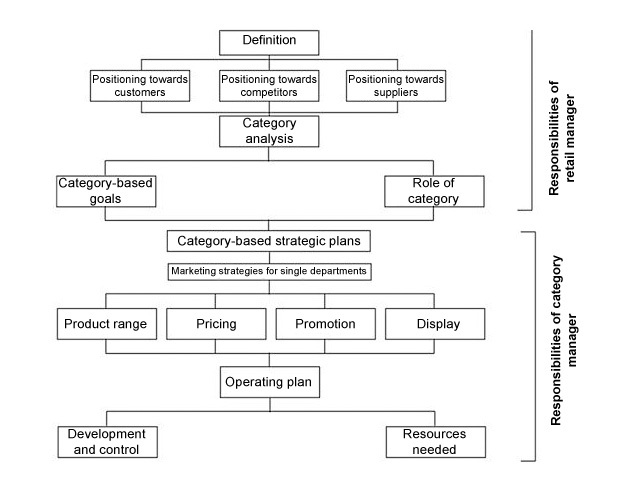 Links between marketing plan and category manager’s duties. Assigning a role to product categories. 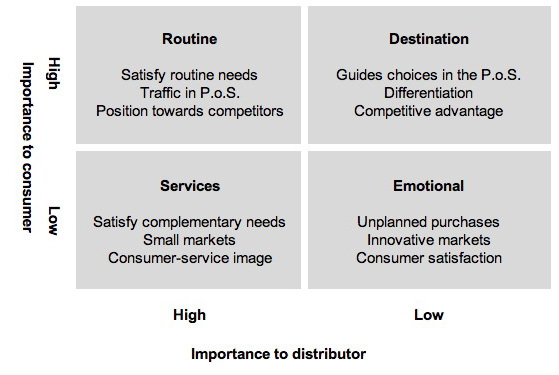 Marketing roles of product categories and their relationship with strategies. The role of category manager. A management process dealing with product categories, treated as strategic business units, that aims to improve outcomes by focusing on the value transferred to the consumer. The role of the consumer. It goes beyond marketing policies to set up an holistic process, including relationships with suppliers and with in-house logistics. It is a radical change compared to previous ideas of marketing, for both manufacturing and trade. 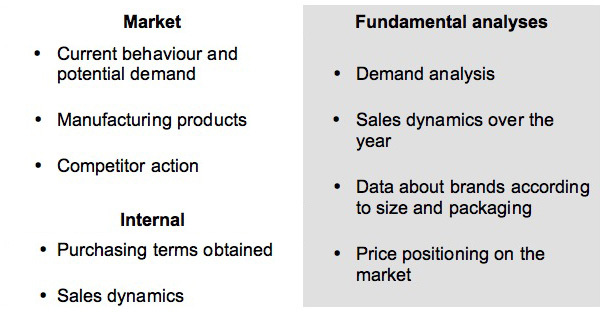 Changed consumer behaviour which affects demand, with greater focus on prices. Growing brand disloyalty among consumers. Difficulty for trade to obtain better conditions from industry (discounts, awards, contributions) which might affect retail price and thus reinforce the image of cost effectiveness. Growing control of the internal value chain by the distributor. Definition of category: the distributor’s choice in defining their field of analysis and thus the scope of marketing action. Assigning a role to product categories: match each category to a specific marketing role which might increase consumer satisfaction. Analysis of relevant information: before devising a plan it is advisable to have all the information concerning the category. Measuring the indicators: each distributor must set new performance targets, check the main internal indicators concerning the category and decide whether they are satisfactory. Choice of strategies: with reference to the role, the internal indicators and competitor behaviour, each brand must decide on the economic-competitive goals to achieve. Defining retail mix actions to support the set goals: the distributor must decide which elements of the marketing mix to rely on in terms of policies concerning product range, pricing, promotions, and display area for the various segments, brands and references. Implementation plan: test the category plan making sure all the indications envisaged are implemented by the peripheral network (branches/Distribution Centres, points of sale). 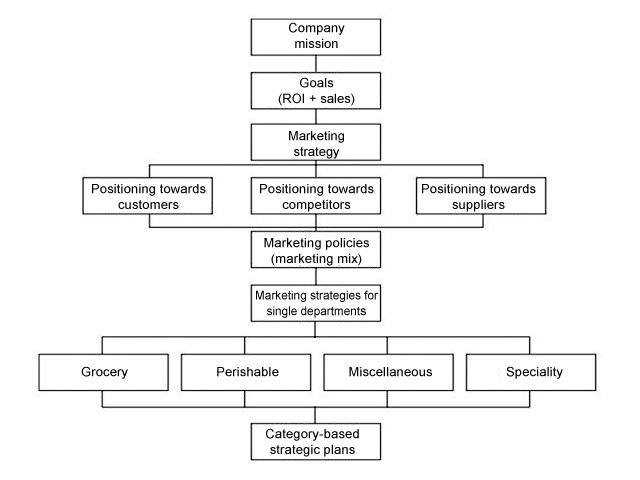 All management activities, with the exception of sales, are carried out by a single subject, who analyses sales statistics together with the store managers, selects the suppliers, decides on promotional and pricing policies, sales objectives and merchandising plans for each store, where management power is limited to the implementation of plans devised by central management. In this model, managers of the points of sale enjoy greater decision-making autonomy: they provide central management with information on the quantity and type of products to purchase. Central management only places the orders and manages the logistics. The buyer is only responsible for selecting the most suitable supplier and negotiating the terms and conditions of purchase. The store managers are responsible for the quantities to purchase and all aspects of logistics. Changes to the structure of the supply chain have led to important changes in the systems for evaluating suppliers. It is now possible to measure and classify the supplier’s productive output as well as their company resources and competences through standardised supplier-rating procedures. Level of over- or undersegmentation considered. how important products are to the distributor. Search for brands and products to include in assortment depending on the role to be assigned to each category. Achieve margin objectives set for categories in the portfolio. Improve overall margins per unit of space in the various channels used.